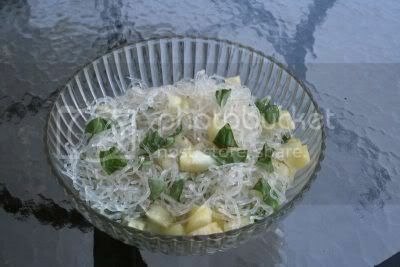 Kelp Noodles are a sea vegetable in the form of an easy to eat raw noodle. Made of only kelp (a sea vegetable), sodium alginate (sodium salt extracted from a brown seaweed), and water, Kelp Noodles are fat-free, gluten-free, and very low in carbohydrates and calories. Their noodle form and neutral taste allow for a variety of uses including salads, stir-fries, hot broths, and casseroles, while providing a rich source of trace minerals including iodine, which kelp is well known for. Their unique texture completes the package, making Kelp Noodles a one-of-a-kind healthful and tasty alternative to pasta and rice noodles. Best of all, no cooking is required. Just rinse and add the noodles to any dish and they are ready to eat! Serving and Storage: Rinse in water before preparing. Cut the noodles to desired length. Store in water after opening. DO NOT FREEZE OR DRY. Are your kelp noodles raw? Yes. Our kelp noodles are a raw food. They do not undergo any heating over 100 degrees Fahrenheit. What do Kelp Noodles taste like? The noodles are neutral in taste and surprisingly not sea-like, which lends to their versatility. Kelp Noodles can be used anywhere. Why are the Kelp Noodles clear and not green? When the outer skin of kelp is removed, the inner portion of the kelp actually looks just like our noodles. Try it out! Sodium alginate is a sodium salt derived from brown seaweed. It is known to help remove heavy metals from your body. What is the shelf life of Kelp Noodles? Kelp Noodles stay fresh in your pantry for up to six months. After opening the package, simply store them in water to prevent the noodles from dehydrating. Do Kelp Noodles need to be refrigerated? The noodles can be stored at room temperature for up to six months without affecting its quality of freshness. Do Kelp Noodles need to be cooked? No. The noodles are ready to serve straight from the package. Simply rinse the noodles in water and enjoy! Why should I eat Kelp Noodles? Kelp Noodles are a great alternative to pasta and rice noodles. Our noodles do not contain any flour, rice or sugar and they do contain an abundance of beneficial minerals. Kelp is known to aid metabolism, promote weight loss, boost energy, aid in digestion, promote scalp and hair health, and help with thyroid function.